You're tough - an experienced adventurer who has returned from countless dark expeditions. But tonight you overindulged at the Red Guardian Inn, a local tavern in Gull, that place known as The City of Terrors. As you left the inn, you were taken by surprise and overpowered by ruffians even stronger than yourself. But just as suddenly, your attackers were surprised by the local constabulary! To hide the evidence, the scoundrels dumped you unceremonious down a sewer drain...down into the Sewers of Oblivion. With the aid of a small, demonic boatman, it's up to you to find a way out. This solitaire takes place beaneath the City of Terrors, but is not directly connected with that solitaire adventure. Sewers of Oblivion is not for novice adventurers - instead, characters up to 7th levels, with as many as 425 combat adds, will find a challenge or two within. However, less mighty characters (150-300 combat adds) will find a more exciting adventure, and greater rewards in the end. 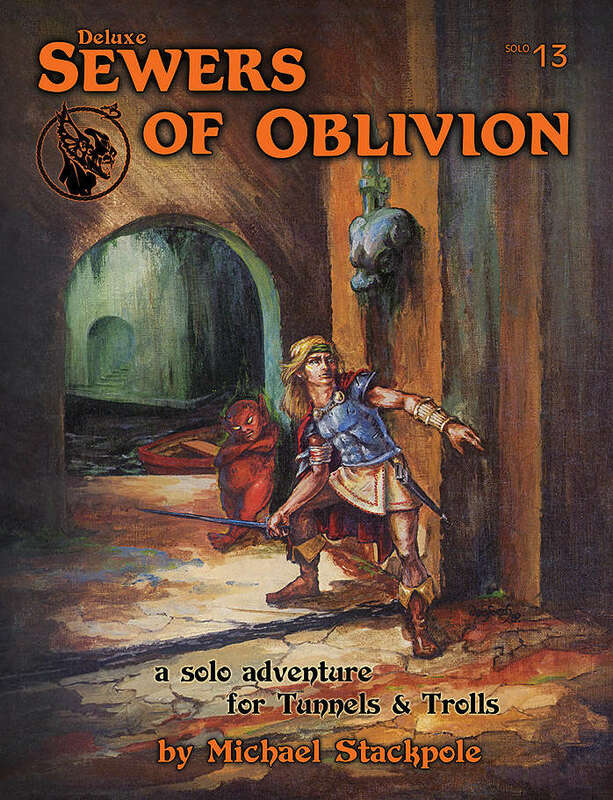 Sewers of Oblivion is #13 in the series of Solitaire Adventures designed for play with the Tunnels & Trolls game system. UPDATE: there are two files here. One is the old 5.0 version that has been available for years. The second (titled "Deluxe") is a new, updated version with some added material to make it more compatible with the new Deluxe T&T rules. This new edition includes a full color map of Gull, more Liz Danforth art, a new forward by Ken St Andre and extra options for escaping some of the dangerous situations in the book and with additional information for using Talents, Speed and Wizardry stats in this adventure. Also includes NPC weapons table and random treasure generator for a truly deluxe edition of this classic solo. 50 pages. Written by Michael Stackpole. Art by Liz Danforth. dT&T updates by Ken St Andre. Just noting, that Tunnels and Trolls isn't listed as the rule system for this. Thanks! Fixed. That was posted a long time ago. Happy to fix the error. Just hoping to help more sales, when people search. T&T forever!